Editor’s note: On the theory that ladies and gents have different plate lunch preferences, we asked two plate lunch lovers to weigh in. Our criteria? Delicious, generous plates that cost $9 or less. Only local-style plates were considered: Korean, Chinese and Japanese bentos and okazuya plates are categories all by themselves. Wherever you go in Hawaii, you’ll find plates with an entrée, two scoops rice and macaroni salad. They’re dished up at the spot around the corner that might have seen better days or the wagon that parks in front of the post office at lunchtime. I’m talking about the humble plate lunch. I travel a lot and make it a point to experience the local foods and culture. Yet after all the dishes I’ve eaten, the Hawaii boy in me craves those local flavors you can only find in a plate lunch. They’re simple, but time and time again I keep coming back to them. For me they define home. Here is my Top 5: Cheap plate lunches. Hawaiian plates don’t come cheap … unless you’re at Yama’s Fish Market. Here you can get your kalua pig plate with either lomi salmon ($7.95) or macaroni salad ($7.35) any day. 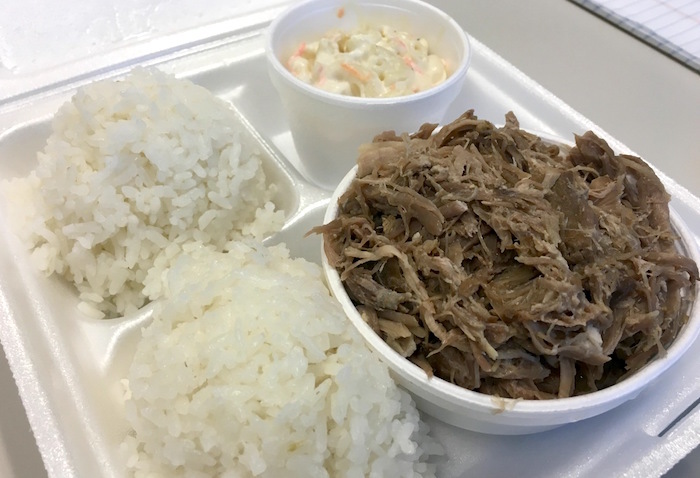 Their smoky, salty kalua pig pairs perfectly with the sweet flavors of the macaroni salad and the onion bite of the lomi salmon. If you’re willing to splurge, get a piece of their strawberry sensation Jell-O ($1.55) or a square of sweet potato with haupia ($1.70) to finish off on a sweet note. Yes, I am including L&L on my list and don’t lie, you’ve been there too. Multiple times. Why? Because portions are pretty generous for the prices and the flavors are consistent no matter which location you hit up—which is why I’m going over the $9 limit for cheap plate lunches by nearly a whole $1! 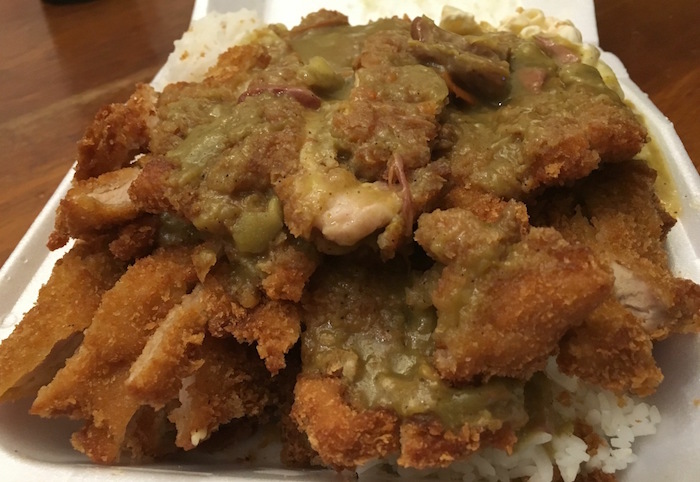 L&L’s chicken katsu curry is one of my favorite lunches, period, and you can’t go wrong mixing these two local favorites! While the plating could use some work, the flavors are stellar. The crispy fried katsu inspires guilt, but mixed with the spice of the curry and healthier vegetables, it all evens out. Don’t plan any meetings or hot dates after a lunch like this. 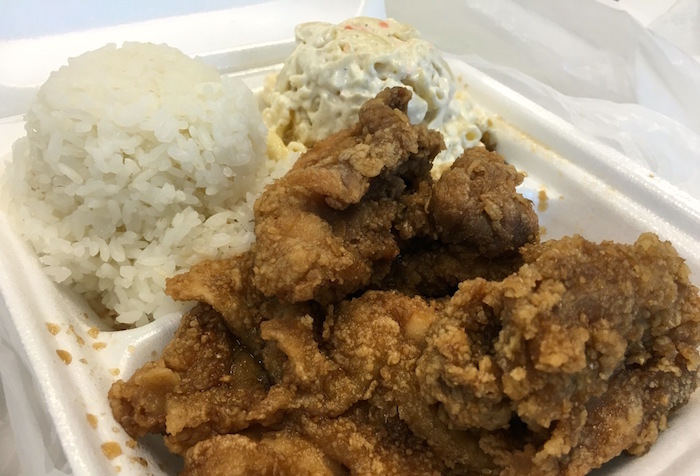 For $7.30, Sugoi’s mini garlic chicken plate is pretty generous: three good-size pieces of chicken that’s breaded, fried and thrown into their famous garlic sauce. While not quite as potent as other popular spots, this garlic sauce is full of bold flavors, and the macaroni salad is nothing to sneeze at. You’ll need a really good appetite to order the full-sized plate. Off the beaten path, Kahai Street Kitchen isn’t the most accessible spot in town. Yet they take plate lunches to another level. 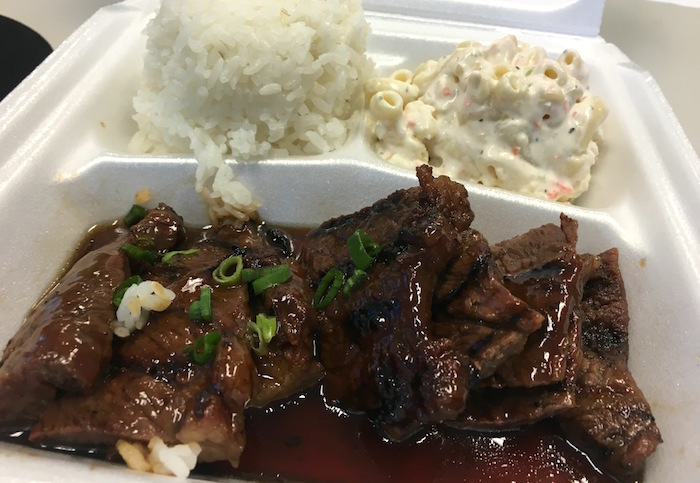 Why get an ordinary teri beef plate when you can get Kahai Street’s teriyaki boneless short rib with that sweet teriyaki flavor and tender meat that doesn’t make you feel like a caveman? Or if pork chop with stuffing happens to be on special that day, don’t miss out because it is pretty amazing. Parking is very limited, so phone in your order and go with a friend who can jump out and pick up your plate lunch while you drive around the block. Rainbow Drive In takes you to a bygone era of takeout windows and meals that come in a paper box topped with waxed paper. While the plethora of local choices beckons, it’s the gravy that you come here for—nostalgic, quintessential drive-in gravy, slightly salty and poured over everything. 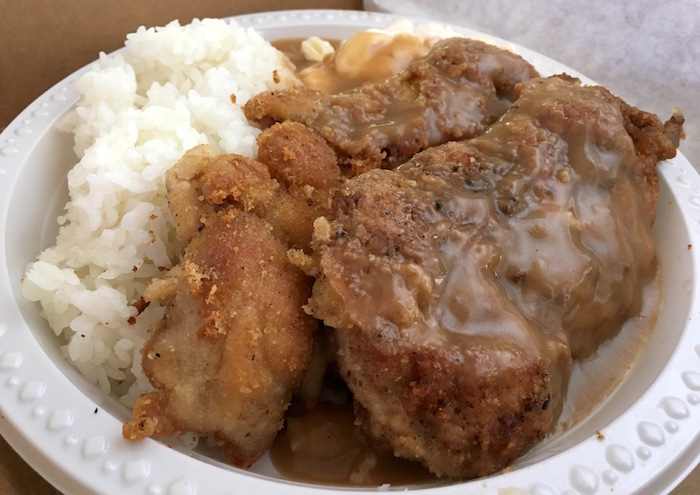 My go-to for years has been their boneless chicken plate featuring two pieces of beautifully breaded chicken topped with that delectable gravy. If something smaller is in order, their loco moco is a nice-sized snack ($3.95 side order, $7.25 full plate) … and you still get the gravy! Ready for a woman’s point of view? Here’s Her Top 5: Cheap plate lunches.